Reports are the primary means by which you print information from your cloud database for use by company personnel and clients. You can certainly format and print in datasheet view directly from a specific form or table, but the best way to print and summarize large sets of data from multiple places in your database is through the use of a visually appealing report. Reports are the best way to create a printed copy of information that is extracted or calculated from data in your database. Reports have two principal advantages over other methods of printing data. First, reports can compare, summarize, subtotal and total large sets of data. And secondly, reports can be created to produce attractive invoices, purchase orders, mailing labels, presentation materials and other output you need to efficiently conduct business. When designing a report you are able to group data and present each group separately by defining separate headers and footers for each group. You can also perform complex calculations within a group or across several groups. As with other items in Microsoft Access, you can embed pictures of charts in any section of a report. You can also embed subreports, which are particularly useful for showing related details or totals of the records that make up specific rows of your report. All of these functions can be set up in the design view of a report, but because reports are primarily used for printing hard copies of your databases essential information the primary view used to work with reports is the print preview view. Remember that for Access 2013 Web Apps, Reports have to exist in the Microsoft Access client so anyone who wants to view them will need an Access Frontend installed on their computer and connected to Sharepoint 2013. Access 2010 Web Databases offer browser-based reporting features with the powerful hybrid application. All client based reporing works in our RDP hosting environment. Being able to print attractive reports is an essential component of Microsoft Access and will benefit your company greatly. This way you can provide hard copies of essential information, which has been drawn safely and accurately from your company’s web database. Check back in with Access Hosting for more information on all the Microsoft Access web database software can do for you and your business. Tables are the basic building blocks of any database. They are defined by a collection of rows and columns that separate the data into individual fields. When you open Microsoft Access for the first time it will give you a blank desktop and will automatically open a dummy table. The dummy table is simply a blank datasheet that will serve as the foundation for any database you will create. After values of a few key fields are entered, you should be ready to begin to input data as short text or number values and create a basic datasheet. When working in Microsoft Access there are three views from which to manipulate the information in the tables that make up your database: form view, layout view, and design view. To change views simply click on the view command in the ribbon and select your view from the drop down menu. Form view is ideal for entering or updating information, while layout view will give you a clear overview of all the information currently entered in the table. Design view is slightly more advanced, and will allow you to restrict the data in certain fields by adjusting the properties and datatype or renaming a field. Designing your own table from scratch may be helpful in certain situations, but don’t forget to check out the pre-loaded table templates that the Access software provides to help save valuable time and gain a better understanding of how to build your own tables with design view. To begin creating a new table the first step is to change the field names. In design view and you can define the parameters of the table by labeling specific fields with a name and matching them with the appropriate datatype from the dropdown menu on the right. There are many different choices for datatype but most likely it will either be a number, which appears as a long integer, or short text. You may also notice that an ID field is automatically entered to correspond with each entry. This is a number that is automatically given to each specific field to stand as its unique identifier. Although it is an option, you should never remove the ID field. The specific identifiers may never be seen by users interacting with your database but they are essential when building more complex relationships between databases. Take notice of the primary key command in the top left of the ribbon. Be sure that the primary key is set to the ID field so that each field can be independently identified and always unique. The database market is divided among four major players: MS Access, Oracle, SQL Server and MySQL. Due to accessibility and focus on user interface, MS Access has garnered some negative press as being unsuitable for professional level database development. However, depending on the needs of the organization, there are many compelling reasons to choose MS Access as your business database software. MS Access is bundled with the MS Office suite, making it the most widely available desktop database program in the world. This also makes it one of the most affordable options for businesses, which tend to purchase businesses licenses of MS Office. The common interface among all the MS Office programs makes it easy to import and move data to and from the database without having to resort to specialized software. Due to the popularity of the product, support for MS Access is also very good, with plenty of online tutorials and articles available, in addition to Microsoft’s excellent customer service. One of the main benefits of MS Access is its ease of use. Even users new to database development can pick up the basics quite easily, as everything is presented in an intuitive manner. Much of the user interface in MS Access is designed to assist users with creating and editing tables, and there are many templates available to ensure that the database meets organizational needs. MS Access also provides options for importing data from other databases, and provides troubleshooting tips for every step of the way. Despite this focus on ease of use, MS Access users have access to powerful SQL tools that allow for rapid development. MS Access is also .NET friendly, meaning that developers wanting finer control of software development can take advantage of the ease of use and functionality of MS Access. Due to the widespread popularity of MS Access, there are many third-party plugins and developmental tools that are available. This means that MS Access is far more flexible than other databases, making it easier to customize and adapt to the changing needs of your business. In addition, there are many more external consultants well-versed in MS Access, and they are generally more affordable than consultants for Oracle and SQL Server. MS Access is an excellent database choice if your organization requires a database that is easy to use and that has established, reputable support structures. MS Access is powerful enough to meet the demands of most small to medium businesses. Best of all you can utilize Access Hosting superior hosting infrastructure to further bolster your Access Database and get it in the cloud easily and securely. All of our services offer a free 30 day trial so that you can easily test everything with Microsoft Access to make sure that it meets your needs. Access Hosting is proud to announce that for 2015 we have increased the storage quotas on all of our Remote Desktop Hosting plans for customers seeking an easy way to move their Access Hosting Database to the web without any modifications. Access Hosting, the leading hosting company for Microsoft Access services and solutions has doubled and tripled the storage on their Access Remote Desktop plans. Customers in need of bringing their Microsoft Access web application to the cloud can now do so without the need for expensive hardware or costly setup. We are happy to report that our Remote Desktop hosting can be configured to connect to Office 365 to use Access to report on your Access 2013 web apps. Our Remote Desktop hosting allows you to use the power of Office 365 as your backend and then you can use our HTML5 PowerRDP technology to get around Office 365’s inability to render Access 2013 reports in the web browser. This is a great way to get more out of your Office 365 subscription with MS Access 2013. If you already have a $29/month Access 2013 Pro or Office Pro plan, you should be able to follow the quick tutorial below to start building web reports for Access 2013 web apps. Login to Office 365 and Navigate to your Access Web App. Click the customize in Access button to download the Access 2013 .accdw file and open it in Access 2013. Navigate to the Info tab of your Access 2013 web app file (accdw) and select the “Report on my Data” button to create an Access frontend that can report on your Office 365 / SharePoint 2013 backend. Now that you are using linked tables to connect to Office 365 and your SharePoint 2013 Access Web App, you can take advantage of all the features of the full version of the Access 2013 desktop client. 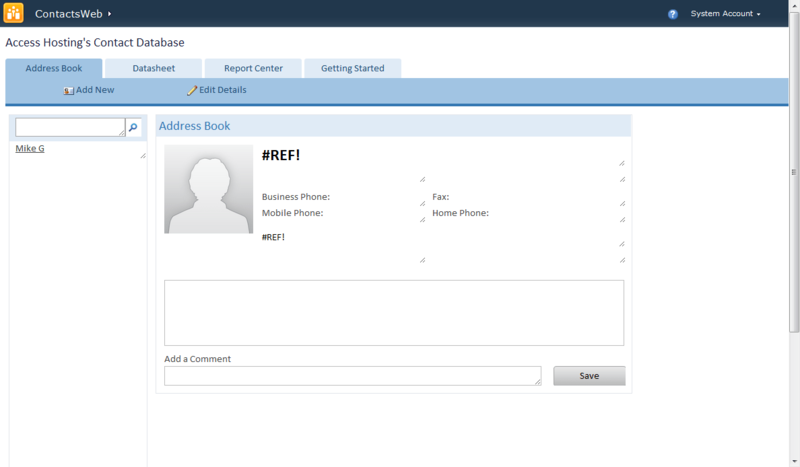 Create and design your reports, forms and queries. Remember to close and save all reports and save your Access frontend file on the Remote Desktop. Now your reports are connected to Office 365 and accessible from any machine, tablet, device and web browser via our Remote Desktop hosting! We are happy to announce that we are once again offering SharePoint 2010 Access Web Database hosting plans. This new plan has a 30 day free trial and is $99/month. It includes 10 users and 2 GB of storage space, unlimited databases, unlimited bandwidth and allows you to combine Web Forms and Web Reports with your existing clientside Access DB functionality for a true powerful hybrid application. These SharePoint hosting plans are completely scalable. Additional storage and users can be added to this plan at any time for additional fees. We plan to continue to offer service to Access 2010 web publishing on SharePoint 2010 and 2013 for as long as Microsoft supports and allows us to license this product. Click here to get started publishing Access 2010 Databases to the Web. SSMA for Access v5.2 is designed to support migration from Microsoft Access 97 and higher to all editions of SQL Server 2005, SQL Server 2008, SQL Server 2008 R2, SQL Server 2012, and SQL Azure.